In response to the recent earthquakes in Nepal the Humanitarian OpenStreetMap Team (HOT) has provided an online mapping platform that allows volunteers to help map the infrastructure of the areas in Nepal effected by the earthquakes. Mapping road networks and structures is critically important to help responders navigate the area to provide assistance to those in need. The online mapping platform can be accessed by any web browser and requires no previous experience to contribute. 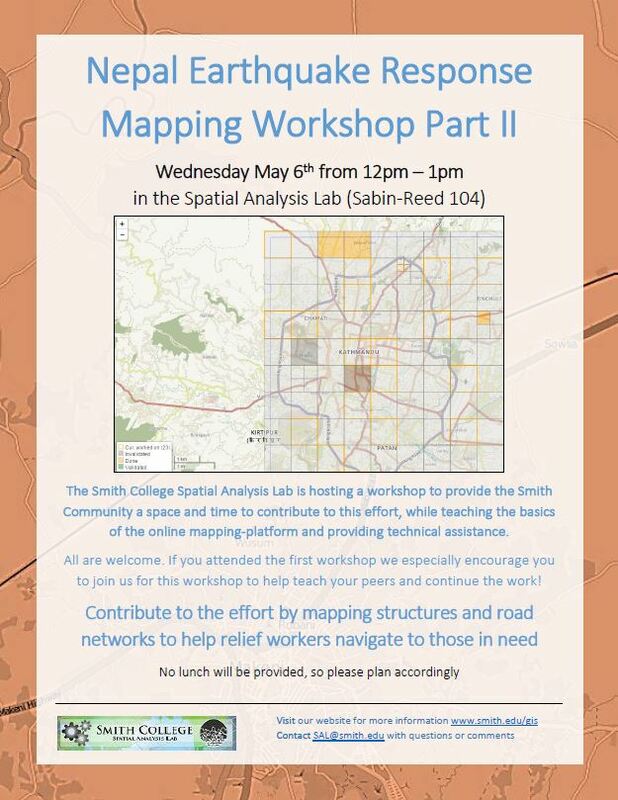 The Smith Spatial Analysis Lab is offering a workshop over lunch this Wednesday, May 6th, to both teach the basics of using this online mapping platform and to provide a space and time for the Smith community to contribute to this effort. All students, faculty, staff, and community members are welcome to join the workshop. It will be hosted from 12pm – 1pm this Wednesday (5/6) in the Spatial Analysis Lab (Sabin-reed 104). Attendees are welcome to join late and/or leave early if necessary. The lab has 20 computers available for use, but participants are welcome/encouraged to bring laptops to work on in the case we have more than 20 attendees.